We provide transparent statistics with api, personal account manager for every advertiser and if you have any questions our support team glad to help you at any time. Your campaign can be on air in less then 20 minutes! You should register in our system and then deposit your account. Our minimum deposit just 100$. We are accept Wire (USD and EUR), PayPal, ePayments, Paxum and Payoneer. You can target your campaign according to the country, carriers, devices, language etc. and you can optimize it by adding the publisher's website identifier in your URL. Now your campaign is ready to start! In general campaigns are approved in less than 20 minutes. If you have any questions our support team glad to help you. We provide popunder, banner, push and video advertising solutions by cpm and smartCPA price models. Our advertisers have direct access to over 500k publishers in 190 geos. A variation on the pop-up window is the pop-under advertisement, which opens a new browser window hidden under the active window. 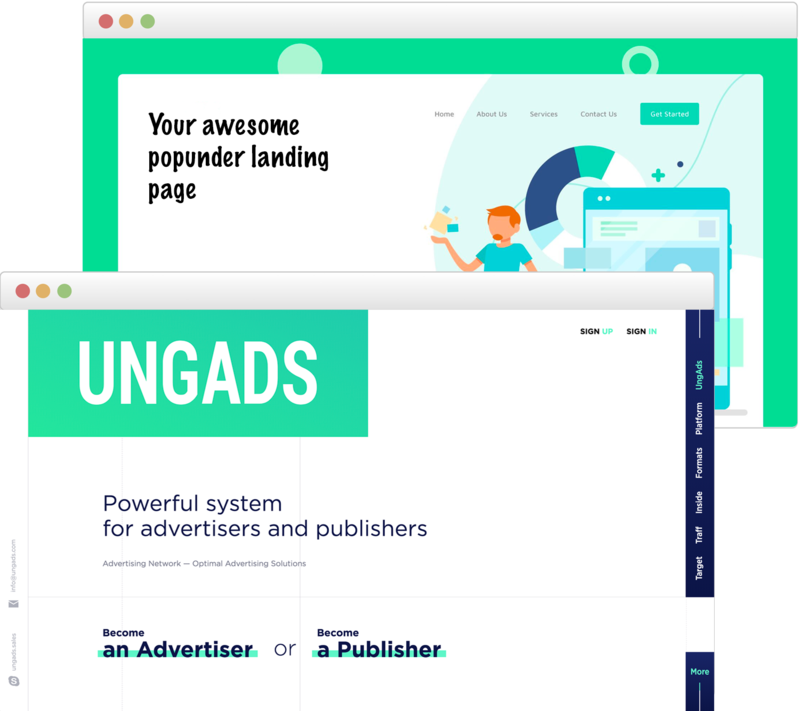 Pop-unders do not interrupt the user immediately and are not seen until the covering window is closed, making it more difficult to determine which web site opened them. Popunders show good results for advertisers who are looking for the low price for certain amount of visitors. This format can advertise you web site, landing page, promo or application. We can confidently say that this is one of the most reliable advertising type, which has proved itself for many years. This is the most reliable type of advert that prove itself during a lot of years. This kind of ads is simple and strong way to promote your product or service. We run the most popular sizes of banners for mobile and desktop traffic: 160x300, 160x600, 300x250, 320x50, 468x60, 728x90, 800x440. Such sizes are optimally placed on mobile and desktop devices. Push notifications are effective ad and the most popular non-aggressive ad formats for efficient mobile and desktop advertising. 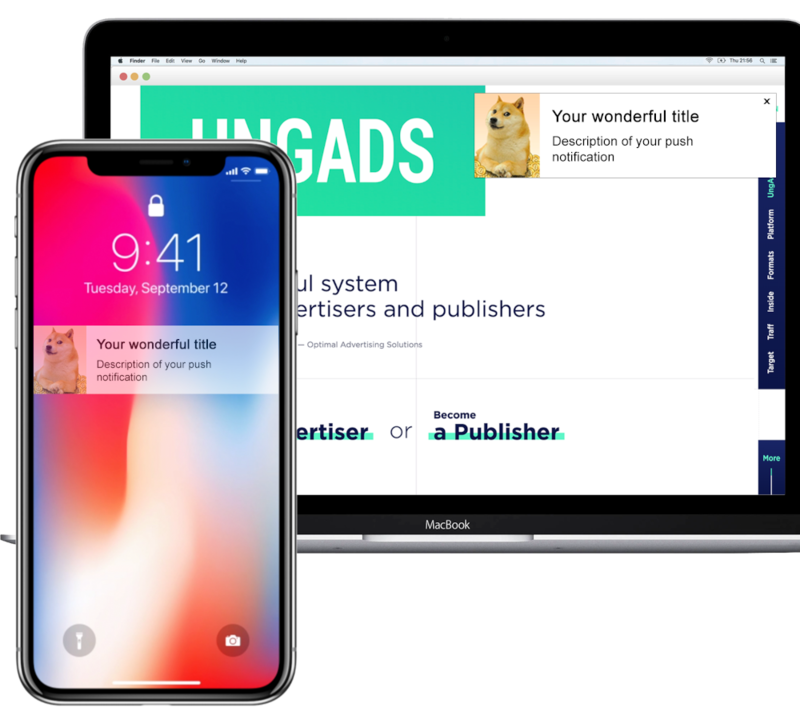 Push notifications are defined as an auto popup ad that shows up as a centered box with an ad text similar to OS notifications and can be applied for android and all desktop operating systems. 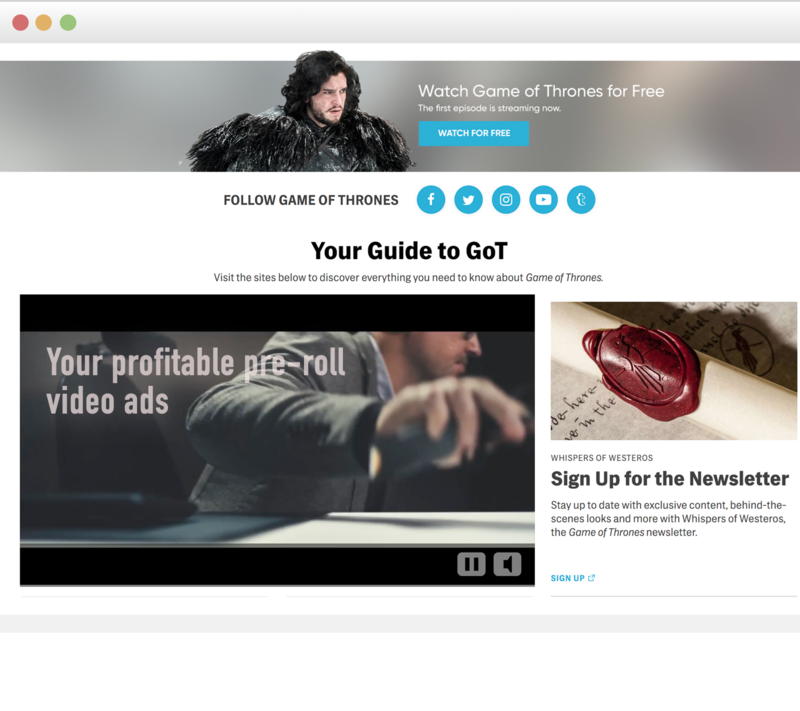 This type of ad has a greater potential among ads due to its non-aggressive design and can be easily closed without web browsing interruption. Push notifications ads are very effective in motivating mobile user to action and are CPA based. Pre-roll is a short video ad shown before the content that user intends to watch. Normally, after 10 seconds the user is enabled to skip an ad to proceed to the video. Just take a quick look at the demo version to see how it works. We can use video + link or we can use your VAST/VPAID tags. You can create your campaign on self-service platform or with your personal manager. Also our support team glad to help you anytime. Manage total, daily and hour limits. Setup extended targeting. Mobile or Desktop; Wifi or 3G; Carriers; Devices; Operation Systems; Time or part of day; Browsers and category. Optimize your campaigns: you can add or exclude publishers, create black and white lists to increase conversions of campaigns. See detailed statistics. Filter, order and sort statistics with useful filters by dates, campaigns, publishers etc. You can export stats to excel. And make analytics by yourself. We have powerful API for fetch statistics, run/pause campaigns and set white and black lists. Our managers pleased to help you with your numbers, graphics and charts. We developed self-service platform for your accommodation. Create, edit, run or pause your campaigns independently. See and analyze transparent statistics using useful filters, use self-service access to financial statistics. Pay easy with PayPal, ePayments, Paxum and Payoneer. Create invoices for prepayment by your self, feel free to ask all questions in support chat on our platform. Don't speak English? Want to talk with us in Spanish or may be Russian? It's not a problem. Optimization department helps you to increase conversions of your campaigns. Support team help you with all questions you have. Technical department help to control advertising campaigns, resolve all tech issues, install postbacks or API integration. Our main goal is to increase conversions for your business, which we successfully reach by high quality traffic and smart campaign management. You can make payment through wire transfer, PayPal, ePayments, Paxum and Payoneer. We work only with prepayment in euro or dollars. 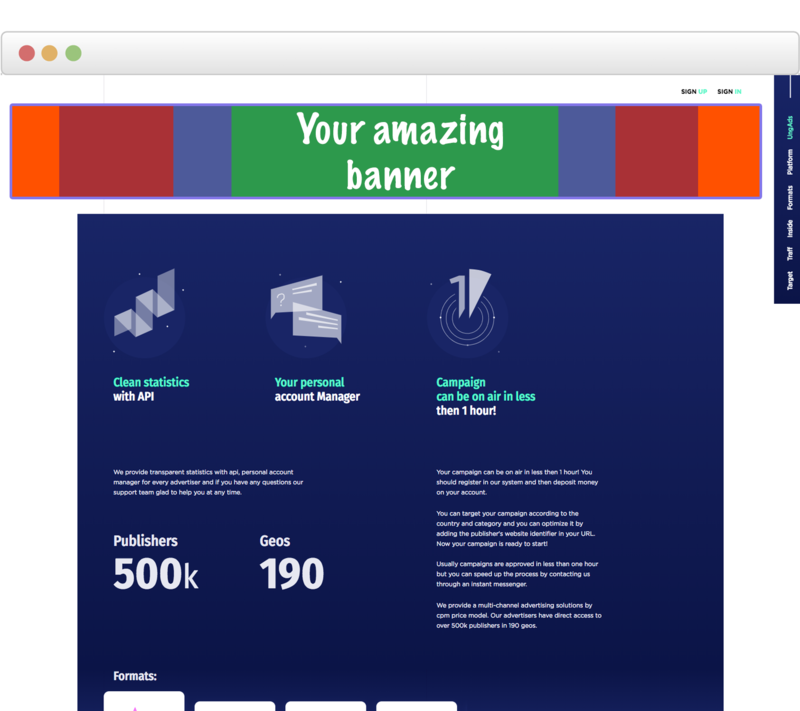 You can create your campaign together with your personal manager or on self-service platform. Then you can manage your campaign using helpful private office. We provide detailed statistics for all campaigns. You can get it on private office at the real time or through powerful API. Our main goals are successful conversion rate of the offers and increase your brand awareness. You can only pay for an audience that are interested in your offer, product or service. You can use smart targeting, maximize the effectiveness of your campaigns. Our experts team will help you choose the best targeting for your campaigns. Optimization is an essential part of the advertising business. We provide our advertisers the ability to set the macro(the placeholder, the token) in the url and get the numbers of sites from which comes the traffic. Analyzing the statistics you can focus your ads only on those publishers which give the maximum result. Optimization an effective tool that can significantly improve the performance of your campaigns and reduce costs. Experienced team of developers create the unique solution in advertising based on 10 servers all around the world and we are able to minimize all discrepancies and other technical risks as well. We developed self-service platform for your accommodation. Create, edit, run or pause your campaigns independently. Also, your personal manager will be pleased to help you. Big volumes of premium traffic for campaigns are provided by many publishers, they supply desktop and mobile format.